Blazon: A Wyvern Or grasping in the Dexter claw a Rod of Aesculaius proper and resting the sinister claw on a Cross Gules. 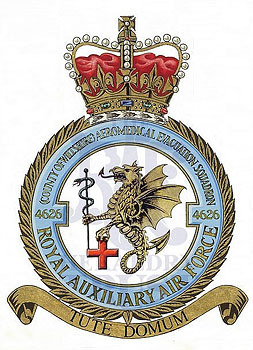 Link: The wyvern was the ancient badge of Wessex and is the dominant symbol of RAF Hullavington where the Sqn is based. The medical role of the unit is shown by the Rod and the international symbol of the RedCross. History: Formed in Jan ‘83 and remains current. Sponsored by 4626 (Aeromedical Evacuation) Sqn R Aux AF, RAF Lyneham Wiltshire.